Aggravated felony assault is a serious charge. Arizona residents charged with this offense are dealing with a case where the victim was either seriously injured or a deadly weapon was used during the incident. A prison sentence is likely for one convicted of this offense. 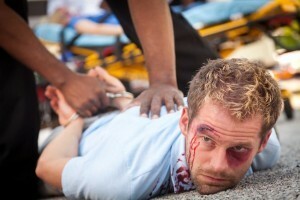 If you have been charged with felony assault it is necessary to contact an attorney immediately. Our Phoenix criminal defense lawyer handles such matters. Call today to schedule your initial consultation. Assault occurs when one injures another or places them in fear of harm. This offense becomes an aggravated felony if serious injury occurs or if a deadly weapon is used during the incident. Such matters will be charged as a felony. The process will begin either by the prosecutor gaining an indictment or by a criminal complaint being filed in Justice Court. If a criminal complaint is filed then a preliminary hearing will be held at which a Justice of the Peace will determine whether the prosecutor may proceed with felony charges. If convicted at trial then one will be facing prison time. It is crucial that you have an attorney who uses all available tools to build your defense and who understands this process. Bretton Barber is a Phoenix area criminal defense attorney defending the accused against allegations of aggravated assault. Bretton will immediately acquire the arrest reports, witness statements, and other evidence, to begin building your defense. He will file any necessary Motions to exclude eyewitness identifications as well as any statements that a defendant may have made to the police. He will explore the possibility that one was not the primary aggressor and, therefore, was acting in self-defense and will also determine if the charge is a result of mistaken identity. He will ensure that you are adequately prepared for trial and that you know what to expect from the process. You need a lawyer who will take these charges seriously as criminal defense is not a “do it yourself” project. Call our office today. In addition to Phoenix we represent defendants in other Maricopa County cities such as Mesa, Glendale, Scottsdale, Chandler, and Gilbert. We also assist Pima County residents in Tucson. Felony assault charges in Arizona often involve the use of a deadly weapon. There are few things which society takes a harsher stance against. This means, quite often, prosecutors will pursue such cases with a high level of vigour. You need an attorney who will give your case a high level of attention. Bretton started the Barber Law Group, in part, because many defendants feel they do not receive adequate communication or service from their attorneys. Bretton promptly returns all emails and phone calls. He also gives clients his personal cell phone number so he may be reached with questions or concerns that one may have. Our promise, to all of our clients, is to strive to provide the highest level of service. We are ready to assist you. Call our Phoenix office.